For our second #UrbiWrite event, we are taking you out of the city! Join us on Saturday 27 October from 10.00-3.00pm, at the Leeds Ukrainian Community Centre, with an opportunity to share your work and socialise afterwards from 3.00-4.00pm. It’s PWYF and you can register here. The Leeds Ukrainian Community Centre is in Chapeltown, at 5 Newton Grove, Leeds LS7 4HW. The Sat Nav will take you to Back Newton Grove but you need to be on Harehills Ave at the top end where it joins Chapeltown Road for the front entrance to LUCC. For those who register to attend, we will give you a mobile number to ring in case you get lost. We did! Please note, this venue has no wheelchair access. 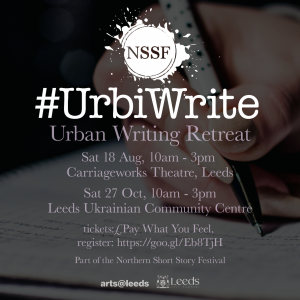 Last month we launched the first of our #UrbiWrite urban writing retreats which will take place on Saturday 18 August from 10.00-3.00pm, at the Carriageworks Theatre, with an opportunity to share your work and socialise in the bar afterwards from 3.00-4.00pm. It’s PWYF and you can still register for that day here. What is #UrbiWrite all about? Need a quiet space to write? Time away from home/the kids/caring? Perhaps you need a writing retreat, but haven’t got the time or money to get away? #UrbiWrite is perhaps what you are looking for. We provide a quiet space where you can work on any written project, whether that’s a short story, a novel, poetry, play, or an essay. It’s Pay What You Feel and it’s right here in Leeds. Please note that #UrbiWrite is not a tutored workshop. It is time and space for you to write. Anybody can come along, regardless of what you’re working on, or where you are in your career. Please come along ready to work. All you need is your laptop or notebook, and your project to work on. Tea and coffee will be provided but you will need to bring your own lunch. 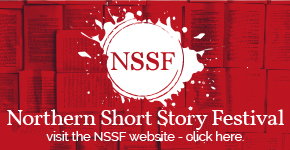 #UrbiWrite is part of The Northern Short Story Festival and Leeds Big Bookend, and is supported by Arts@Leeds and Leeds City Council. Previous story #UrbiWrite – The Urban Writing Retreat For You!